Fully cleaned, tested and working great. Original case and manual included. Trending at $29.59eBay determines this price through a machine learned model of the product's sale prices within the last 90 days. Franklin Crossword Puzzle Solver Model CWP-206. Franklin Spell Corrector & Puzzle Solver SA-309 New Sealed - Crossword . Condition is Brand New. Shipped with USPS First Class Package. Has been tested and is in good working condition. It is missing the screw for the battery cover. Does not affect the functionality whatsoever. FRANKLIN CROSSWORDS SOLVER WITH WALLET. GOOD CONDITION. SEE PICTURES FOR DETAILS. Condition is Used. Piece has been tested and is in working condition. No batteries are included in this sale (runs on 4 AAA batteries). Franklin Next Century Electronic Crosswords Puzzle Solver NCC-100. Great condition! Franklin Crosswords Puzzle Solver CW-40 Handheld Crossword Helper, Wallet (Case). Condition is Used but excellent condition. Includes the orginal leather sleave and original instruction manual. Shipped with USPS First Class Package. Pre-owned Good condition tested and works. Battery still works, will send with battery included. Like new Franklin SA 309 Spelling Ace Pro and Puzzle Solver Thesaurus. Minor residue on the back from a sticker that has been removed. Franklin - Crosswords Puzzle Solver - CW-50 - Tested - with Soft Case & Manual. Condition is Used. It is tested and in good working condition. Includes case and new battery. Tested and working. Good condition. Minor scuffs and scratches from normal use. See photos. Batteries not included. Ships within 24 hours of payment. Franklin Next Century Electronic Crossword Puzzle Solver NCC-100 Works great Thanks for looking. Please check out my store for more great items. Franklin CWP-206 Crossword Puzzle Solver –Very Nice. Find Missing Letters In Your Puzzle By Using A '?'. In Place Of The Unknown Letter. Provides Easy Way To Search. Large, High-Contrast Display Screen For Comfortable Lookup. This is a Franklin Crossword Puzzle Solver! This spelling solver is in good working condition. Franklin Spelling Ace Pro and Puzzle Solver - SA-309. Franklin Merriam-Webster Crossword Puzzle Solver CWP-206. Good condition with some wear. Cover is loose and detaches easily. Some leakage in the battery compartment. Tested working. See pictures for exact condition! Requires 4 "AAA" Batteries which are included. 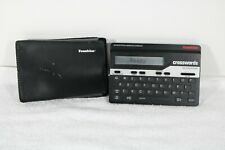 Franklin Merriam Webster CWP-206 Crossword Puzzle Solver - With Box - Free Ship! Device has been tested for functionality and can confirm that it works. Requires 4 - AAA batteries (batteries not included). Want it a lot faster?. 4.5 out of 5 stars - Franklin Merriam Webster CWP-206 Crossword Puzzle Solver - With Box - Free Ship! 7 product ratings7 product ratings - Franklin Merriam Webster CWP-206 Crossword Puzzle Solver - With Box - Free Ship! Good used condition. Missing flip top. Tested. Requires 4 AAA batteries, not included. Ships fast and free. Franklin Handheld Crosswords Puzzle Solver CW-40 with Protective Case. Condition is Used. Shipped with USPS Parcel Select Ground. Works good. It takes 2 AAA batteries. Manufacturer - Franklin Industries USA made in China. Condition - Overall good condition. Found at an estate sale. Thesaurus With 500,000 Synonyms & Antonyms. It fits in the palm of your hand, will easily to fit in your pocket while traveling. Word Builder Uses The Letters Entered To Create A List Of Possible Words To Help Solve. Franklin Spelling Ace Pro & Puzzle Solver Model SA-309. Tested working full as pictured no accessories included only main unit. Used condition, tested and working well, includes case. Crosswords Puzzle Solver. By Franklin Electronics. Includes: Black Holder & Users Guide. Next Century. Pocket Size. Franklin Crosswords Puzzle Solver CW-50 - With Soft Case & Manual ,Condition is Used. Item is in great working used condition.